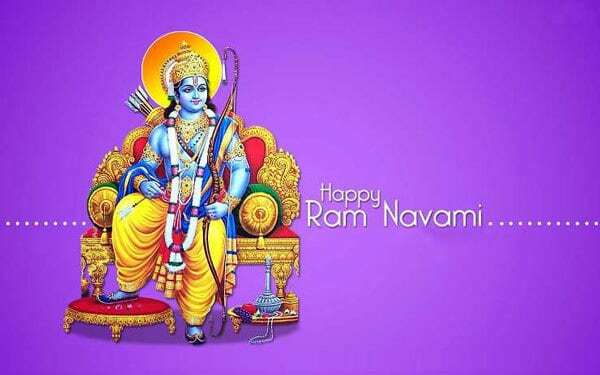 Ram Navami is a popular festival for Hindus to celebrate the birth of Lord Rama.This is Navami Tithi of Chaitra which is also the beginning of the Hindu Lunar Calendar. It marks the ending of the spring festival of Chaitra Navratri that begins on Ugadi. Rama, the 7th incarnation of Vishnu, was the idol of the Ramayana, the earliest Sanskrit epic. It was a battle between evil and good, Ravana and Rama. Rama was the incarnation of Lord Hari, who incarnated on the earth for the demolition of Ravana. The Ramnavmi is the celebration when the devotees have the golden opportunity to drench themselves in thememory of Lord Rama and his good deeds for humans. One can be a real follower of Lord Rama, if they make an effort to grow all the qualities that he had. Thus, worshipping of Lord Rama will provide them the way to develop such qualities. On that auspicious day, followers take an oath that they will recur Ram-Nam with every breath to lead a virtuous life. This is one of the major festivals of the Vaishnava. On the day, followers come across the world and even from the abroad. They, gather in Ajodhya to take a holy bathe into river Sarayu and then they visit the Rama Temple to take a part in birthday merriment. Though this is the day when Lord Ram was born, yet some of the devotees suppose that prayers and offering on the occasion will bring wealth, health, and prosperity to them, which is not at all wrong. Ram Navami, performed on the birth of Lord Rama, is believed to be completed during Madhyahna Periodwhich is middle of Hindu day. The faithful timing depends upon the sunrise and the sunset. Hence, it is difficult to measure the correct time of celebration. Most of the time, it falls amid 11A.M and 1P.M. A continuous narration of Ramcharitmanas takes place throughout the month of Chaitra, previous to the celebration. To make the day very pious, the followers perform fast and restrict themselves to a specific veg diet; they will not take foods like wheat products, onions, garlic, etc. The celebrations are doneat all the major places relatedto Sri Rama, such as Ajodhya in Uttar Pradesh and Ramesvaram in Tamil Nadu. Ajodhya is the place where the fair prolongs for 2 days along with the Rathyatras, moving with the Deities of Ram, Laxman, Sita, and his furthermost follower Mahavir Hanuman, from almost all Ram Temples. Hanuman is identified for his devotion to Rama, and his tales form an important part of the celebration. In Andhra Pradesh, the celebration continues for 10 days from the Chaitra Saptami to the Bahula Padyami that fall in March and April. All the temples re-create the marriage of Lord Rama and Sita to honor this event since this day is also the day they got married. Some maintain a severe fasting on this special occasion. Temples are festooned with the picture of Rama. Devotees go to hear Ramayana Katha in the temples. We find a beautiful fair held at Ajodhya, the hometown of Sri Rama. In South India, this festival is celebrated for 9 days with great devotion. The talented preachers narrate the exciting chapters of the Ramayana. They also perform with the blessed name of Rama and make merry on the wedding day of Rama with Sita. It is a highly inspiring ceremony and instructive too. Ram Navami is celebrated in a variety of ways. Bhajan is one of the vital parts of the ritual. Akhanda Ramayana Path includes chanting of the entire Ramcharitmanas; usually, it takes 24 hours. Chanting the whole Sunderkand; it will take three hours. In addition, people purify their homes and paste pictures of Rama, Lakshman, Sita and obviously of Hanuman. Some Flowers along with incense are set aside before the deities. The two dishes are prepared for the puja; some other important ingredients are collected, includinga Pan, Roli, Rice, Flowers, Water, Bell and a Conch. The puja starts with the youngest female member of the relatives applying Teeka to all the male members. Everyone stands for the Aarti.Bhajans are performed throughout the entire puja.In the last, Prasad is distributed among all. In 2018, Ramnavami will be celebrated on 5th March(Sunday). Puja Muhurta will start at 12:12pm; it will end at 14:36pm. The Navami Tithi will begin at 10:32am on 25th March 2018 and it will end at 08:24am on 26th March 2018.